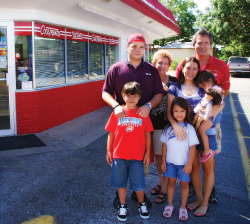 When Langford comes to Sherman, he heads to the store on the corner of W. Houston and Sunset for a DQ fix. “Two Beltbusters and a Chicken Strip basket,” shouts Vicki Armstrong at the kitchen a few steps away. Armstrong has worked at the Sherman Dairy Queen since 1968. That’s 40 years of putting curly-Q’s on ice cream cones, so she is used to the hubbub. Customers are three deep at the counter. “I don’t mind the wait,” Langford said. “I’d rather my hamburger come fresh off the grill. Even though it’s ‘fast food’, this is the best hamburger you can get in Sherman. I’m obviously a connoisseur,” he said with a smile and a pat of his belly. Langford and Saunders represent the kind of loyalty that made Dairy Queen almost as much a part of the Lone Star State as cowboys and football. It took DQ a few years to find Texas, but when it did, Texans wasted no time finding DQ. Sherwood Noble opened the first DQ in Joliet, Illinois, in the summer of 1940. World War II slowed down the idea’s spread, but by 1947 there were 100 stores, mostly in the Midwest. DQ came to Texas in 1947, the year the curly-top cone business exploded, and by 1950, customers were lining up at almost 1,500 stores nation wide. Maybe it was the ice cream or maybe the hamburgers, but post-war America was ready for fast food, and nowhere was DQ welcomed with more open arms and howdys than in Texas. By 1980, there were more than 1,000 stores in the Lone Star State. A commercial proclaimed that DQ was “the Texas stop sign.” There was a DQ in just about any Texas town big enough for the teenagers to cruise up and down “the drag,” with pit stops at the DQ for sustenance. At its heart, Dairy Queen was a small-town thing. The smaller the community, the more important was the local Dairy Queen. More than just a hangout for kids, it became a town center, a meeting place, where the men gathered for coffee in the mornings and the women got together for a break in the afternoons. Everybody went to the Dairy Queen. Part of the DQ’s success was obvious to anyone who looked closely. There wasn’t much competition. A root beer stand, maybe, or a knock-off Dairy this or Frosty that, but none of them had the prestige of Dairy Queen. A new DQ was a sign to all that your hometown counted for something. Not so long ago, Sherman had four DQs, and Denison had three. Now Sherman has two and Denison none. Dave Sroufe’s family was Sherman’s Kings of Queens. Highway expansion swallowed one of their stores years ago, but until recently, the other three locations were rocking along. Sroufe ran the downtown location on Lamar; his parents had the store on the west side, and his brother-in-law, Ron Ruppel, held court on the east side of town, not too far from Sherman High School. One local wag referred to the family as the “hamburger mafia,” a title they printed on business cards. Sherman Dairy Queen’s west side crew: (left) Andrea Sroufe, Grace Jenkins, Kenneth Ferguson, Vicki Armstrong and owner Dave Sroufe. The elder Sroufes retired, and Dave ran both the downtown and westside locations. But that was a killing schedule, so he shut down the Lamar Street store and moved west. A lot of his regulars just picked up and moved with him. The store now has two “figure out the problems of the world” coffee clubs, one that meets early in the morning and the other with an afternoon meeting. “We come up every morning because we like to hear all the bull, but I’m only into hearing it, not into telling it,” said retired dentist Jerry Anderson. “Don’t believe that!” retired principal Sam Wilson shot back. He was recently invited to join the folks who only “listen” to morning bull. “Just remember you’re a provisional member,” Anderson warned Wilson with a raised eyebrow. What does Wilson get if he makes it through probation, a pin, a plaque, a card? “You get nothin’,” Anderson said. “You get picked on a lot,” Wilson said. Vicki Armstrong on the west side agreed. “We see everyone in here, from newborns to hundred-year-olds. We enjoy our customers, and we treat them like family,” she said. (No, that doesn’t mean she’ll loan you money and argue with you at Thanksgiving dinner.) “People I’ve known for years will come in and talk heart to heart with me and they know this is as far as it goes. While Armstrong was chatting, someone else covered the counter. “May I take your order please?” the cute, blue-eyed, pony-tailed blonde chirped. The customer stopped scanning the overhead menu and looked down at the order taker standing ready with pad and pen. She was barely tall enough to rest her elbows on the counter. He seemed puzzled. This DQ girl should be playing with Barbie, not making Blizzards. “I’d like a BeltBuster, no onions,” the customer said. “Can I make that a meal for you?” Eight-year-old Grace Jenkins may be shorter than the Coke cooler behind her, but she has learned the first rule of a good salesman—always be closing. It worked. The man nodded, and his order was off to the kitchen. Grace has hundreds of orders under her belt. “When she was four we would get a milk crate and put it near the drivethru window. She’d stand on it to look out and wait on people. It was pretty funny,” said step-dad Dave Sroufe. On Sherman’s east side Dairy Queen’s royal family is owner Ron Ruppel’s growing clan of future DQ workers. Currently, there are more DQs in the Lone Star State, 575, than in the next two states combined. Illinois has 270, Minnesota, 254. There are Dairy Queens in every state but Vermont. In 48 states, one Dairy Queen is pretty much like the other, but Texas is a world unto itself, DQ wise. Texas is so large that DQs here have their own food system—Texas Country Foods. We have our own Tex-centric menu. “Brazier” DQ’s refer to a grilling style. Lawton Langford found out about “foreign” DQs the hard way. “My family was on vacation in Florida, stopped at a Dairy Queen to eat, and ordered hamburgers. It wasn’t the same,” he said with a vigorous headshake, as if trying get rid of a bad memory. 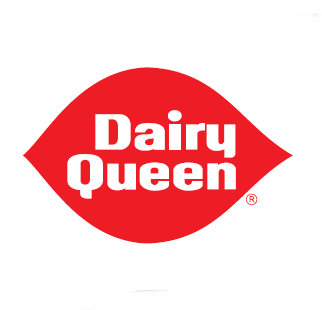 For Dairy Queen loyalists such as Langford, DQ’s glory days may be yet to come. There are now only 575 DQs in the Lone Star State, but Warren Buffet’s Berkshire Hathaway has made the franchise part of its holdings, and expansion rumors are floating around. Perhaps Buffet has decided to build his next billion on burgers. The front door opens and a handful of people walk into Ruppel’s store. “Hey, how are you?” he asks. The customers respond with smiles all around. So this is the “hamburger mafia.” A large Blizzard beats concrete shoes any day.